Hello everyone! Thank you for visiting my website, and I apologize for the long hiatus. It was quite hectic finishing up graduate school the past year, but I'm finally finding time to update my website. I've started working as a co-coordinator for the English Success Center at Cypress College. It's definitely a big change from teaching ESL, but I'm hoping to continue working in both areas. I love the dynamic of working with students one-on-one, but I also enjoy the lively atmosphere of the classroom setting. For those of you who are interested in tutoring ESL students, here's an article I found very helpful. Looking for some online resources that provide news articles or talks for your English language learners? Trying to find topics your students can discuss or debate about? Take a look at some selections below. News articles are adapted into three levels (beginner, intermediate, advance). An audio clip is provided for each news article, so students can read and listen to the news. I think the language used in these discussions are quite difficult for English language learners, but they can still be useful. Teachers can get ideas about what topics students can discuss in class, use the text as a model for how to write position papers, analyze grammar structures, etc. This would be most suitable for advanced learners. Offers talks on a great array of topics, and transcripts are available as well. Students can use this for extensive listening practice, and teachers can use clips from the talks in class for discussions, writing assignments, etc. News articles with audio is available in two levels. You can also find videos imitating TV news, and also videos about learning English (e.g., learning non-count nouns). Appropriate for intermediate-advanced learners. This is a weekly public radio show broadcast that you can stream online, or download as a podcast. The show chooses a theme and presents different stories on that theme. The teacher can pick and choose stories that can be used as a source of discussion, etc. NPR is very accessible, and there is great variety in the type of news and talks they offer. The pace of the talks are well moderated, so English language learners can listen to clear English while still being exposed to different dialects of English. This would be suitable for advanced learners. I think this corpus is more user-friendly than COCA, so it would be great for English language learners to use. I like that you can instantly see the academic words from the text, check the definition, and explore different collocations. This is a great tool for directly linking vocabulary with the text, emphasizing on context. To help students improve their knowledge of collocations, teachers can have students look at their previous writing assignments, noting phrases that they overuse or feel limited in using. In class, the teacher can demonstrate how to search for similar collocations on the website (insert a sentence, click on the “phrase” option, click on words to form a phrase, and select “synonyms” to generate phrases with similar meanings). At home, students can find new phrases through this search method and write a paragraph using the new phrases in order to demonstrate understanding. It can be frustrating when you're looking for quality websites with movie clips and/or teaching ideas for your ESL/EFL classroom, only to find mediocre or outdated ones. I've done some searching as a new teacher and grad student, and I've come across several websites that I keep coming back to. I hope that these will be helpful for you as well! This is a wonderful website where great movie clips and grammar lessons meet. The movie clips are categorized by grammar points, levels, and there is even a category for kinesthetic learners. The movie clips also specify the target age group. For each video clip, there is an activity and supplementary worksheets. Less prepping + students being entertained and learning important skills = happy teacher, happy students! Finding good movie clips is one thing--finding whole lesson plans based on a movie clip is another! Here you'll find lesson plans for each video and film that not only focus on teaching English, but help cultivate critical thinking skills. This can help initiate meaningful discussions where students can share about their values and thoughts on various topics. This site offers movie scripts (and a select few TV scripts) available for download. The movies are categorized by alphabetical order and genres, and there is a separate list for TV scripts. The website is updated regularly with new movie scripts. This would be great for analyzing grammar, etc. Help! What should I do? What shouldn't I do? #1: I'm going on a blind date tonight. I'm so nervous! What should I talk about? What should I not talk about? #2: My roommate never washes the dishes or takes out the garbage! I've kindly asked her several times, but nothing changes. What should I do? What should I not do? 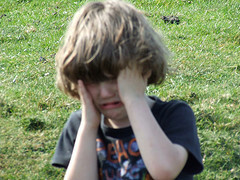 #3: My best friend got a terrible haircut and she's very upset. She looks like Willy Wonka! 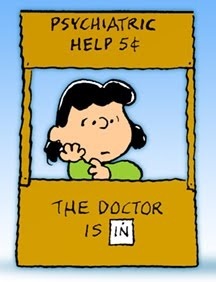 What should I tell her to make her feel better? What should I not tell her? Need help with phrasal verbs? Try Phrasalstein! 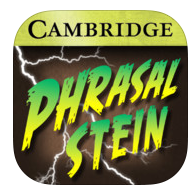 Phrasalstein is a game app created by Cambridge University Press that allows users to learn phrasal verbs in a fun and casual manner. As you can probably tell from the name, the theme of this game is "horror," coupled with humor. This app teaches 100 phrasal verbs with sample sentences, focusing on both common and uncommon meanings. The animations will help users visualize the context for when the phrasal verbs are used. Podomatic is a great podcasting tool available on the web and also on mobile devices. You can record the podcasts directly to Podomatic, or you can upload a pre-recorded file. These podcasts can be listed on a web homepage, and you can add tags on them. It’s simple to use, and there are many possible uses for this. The teacher can use this to teach language structures, give tips on writing, etc. Students can create their own podcast “show” where they regularly speak on a topic given by the teacher. These podcasts can be shared, so maybe students can listen to each other’s podcasts and write summaries about them as a listening task. *There is also a minicast option, where you can upload audio and photos to make a video slideshow. Do you remember using actual note cards for class presentations and speeches back in the day? 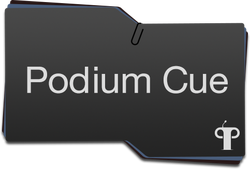 With Podium cue, you can create and use presentation note cards in a digital form! I personally used to use note cards more prior to college, but I thought this was a neat way to organize content without the trouble of writing things out physically. (No mess!) This is a great way students can organize their ideas for a speech or presentation on their iPads. Do you worry about copyright issues when using digital pictures for your classroom presentations and activities? Fear no more! ELTPics offers a wonderful collection of photos taken mainly by English language teachers for teachers. The photo sets are available on the Flickr account here, and are not only categorized in a teacher-friendly manner (e.g. prepositions, spot the differences), but teachers will not be liable to copyright issues so long as they are for non-commercial uses. Another neat thing about ELTPics is that you can also contribute your photos to this site. Every two weeks, a theme will be announced publicly by the curators on Facebook and Twitter, which you can keep track of by following the hashtag #eltpics. 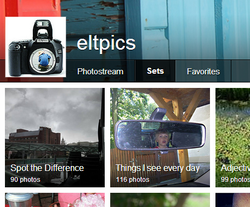 You can then contribute relevant photos by adding the hashtag #eltpics on your posts. This way, teachers can be users and contributors to this site. You can read more about this here. i) Please only post pictures that you have taken yourself. people's faces unless you have their permission. death. Please respect this. If in doubt, it's best not to post. iv) Please keep taking photos and have fun using ELTpics in class. Incorporate visual communication with Evernote's Skitch! Evernote’s Skitch is a great tool to visually communicate ideas. Whether it's a picture from your camera roll, a screenshot of a website, or even a map, students and teachers alike can explain or comment on them using tools such as arrows, stamps, writing, etc. These images can be saved and shared with others. I personally am an avid use of Evernote, so I was very excited when I found out about Evernote's Skitch. (I downloaded it right away!) What's great about Skitch is that it cultivates collaboration and can make classroom tasks more vibrant. Students can use Skitch to help explain images to their peers, and can send them to each other to increase collaborative learning. Students can create their own advertisements by marking up an image. Teachers can use marked up images to better explain a concept (e.g. a grammar point) when presenting to students. What are some ways you can use Skitch in your classroom? Here you will find some new technology finds, learning resources, and miscellaneous teaching activities.